I don't know about you - but growing up in my family, Christmas was never complete without a pair of new pajamas. I'm not sure why, but there was something comforting about receiving them -and to this day, it's a tradition we've maintained. So, of course, I had to add pj's to the Frugal & Fabulous holiday gift guide! The wonderful people at Sleepyheads recently sent me a pair of their adorable Lips Pajamas to review. 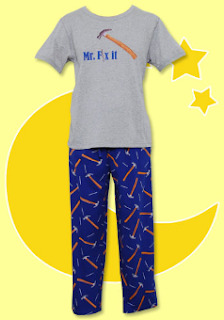 These pj's are super comfortable and are made of 100% cotton. They are a classic lounge style with satin trim. The top is a button front and the bottoms have an adjustable satin drawstring waist and an elastic waist band. The first thing I noticed about Sleepyheads' pajamas that the fabric was high quality and very soft (kind of like a jersey). The pjs were pretty true to size, and were loose enough so that they were comfortable, but still pretty fitted. But more than anything - they were comfortable to sleep in - no tossing and turning and having to adjust! Sleepyheads' Web site features awesome brands like David & Goliath, Betsy Johnson & more. And Sleepyheads has their own brand of pjs that are absolutely adorable! Verdict: These pajamas are a cozy classic that will definitely warm up your holiday season! I highly recommend adding sleepyhead pajamas to your shopping list! Buy it: Use Code "FREEGROUND" at checkout to receive free ground shipping! *Tell me which pair of Sleephead.com brand pajamas you would like to win. 8. Add the Frugal & Fabulous holiday gift guide logo to your blog. You have until Wednesday, Dec. 16 @ 7pm EST to enter! (Winner must respond within 48 hours.) Giveaway open to U.S. residents only. There's too many to choose from! I might have to choose the crossword puzzle set for now though! I also subscribe in my feed reader! I would love the Cosabella Bamboo Black Cami & Pant! entered Rug from Rugs USA Giveaway! I love the Fresh 'n Funky Cherries Lounger Pajama. They are just too fun and cute. Wow! There is lots of great sleepwear at that site! It'd take a while to go through it all and pick just one item, but I guess I'd like the Karen Neuberger Hot Coldture Snowman Pink Short nightgown. I entered your SkinMD Natural Shielding lotion giveaway. I entered your RugsUSA giveaway. I entered your n-Fini giveaway. I'm a Facebook Fan of Frugal and Fabulous. I'd like the plaid long sleeved lounger pjs! PJ Salvage Wild Safari Black Velour Thermal Lounge Set, looks really fun, but there are so many, it's hard to choose! Wow there are so many to choose from. I really love the Life is Good Snowflake Thermal Lounge Set. So cozy! PJ Salvage Bear With Me Black Sleepshirt is my pick! I like the Sleepyheads Daisy Pink & White Longsleeve Lounge Set. I entered the N-fini Shapewear Giveaway! I'd love to win the Sleepyheads Clouds Blue Cami and Pant in size x-small for my daughter. The Sleepyheads Crossword Black & White Lounger Pajama. I entered the N-fini Shapewear Giveaway. entered $50 Gift Certificate to N-fini Shapewear! I like the Sleepyheads Clouds Blue Cami and Pants. I love the D'Lish Deep In The Heart Of Texas Cream Lounge Set! This would be perfect for my sister! I entered your rugs USA giveaway! I entered your N-fini shapewear giveaway! I entered your skin MD giveaway! Sleepyheads Clouds Blue Shortsleeve Lounger Pajamas. So cute. I am a subscriber by feedburner. I would like to win the Big Feet Black & White Flannel Footed! I'd like the Carole Hochman Sunlit Blossoms White Pajama, they look so comfortable. I like the Sleepyheads Lips White Tank and Short Set! My favorite are the Munki Munki Owls Purple Flannel Pajama. I adore the Sleepyheads Clouds Blue short-sleeve lounge set! I love the The Cat's Pajamas Chocolates Pink Flannel Pajama. I love the Life is Good Daisy yellow and pink lounge set! Oh how good would I sleep in those! I like the Sleepyheads Clouds Blue Shortsleeve Lounger Pajamas. I like the black and white lounger.. I'd choose the Sleepyheads Toddler Plaid Flannel Footed Pajama. I love the Hatley line, especially the Moose on Red sleeper in 18 months. I love the cherries pj's. We too have a tradition of pfs for Christmas. I am an avid follower by email! I entered the rug giveaway as well. I love the women's sleepyhead plaid flannel lounger. I entered the rug giveaway. I would like the PJs with the Cherries! So Cute!!! I love the Sleepyheads Happy Snow Days Blue Flannel Lounger Pajamas, thanks! facebook fan - Idaho Jill, thanks! 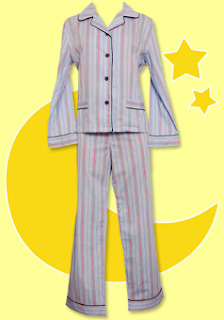 I like the Sleepyheads Daisy Pink & White Shortsleeve Lounge Set. I entered the Inspire your walls giveaway. I like the Happy Snow Days Blue Longsleeve Lounge Set. I also entered the decal contest!!!! I entered the decal contest as well. I love the lips pj pr the mariposa lounge set. My daughter would look so cute in theSleepyheads Daisy Pink & White Shortsleeve Lounge Set! I entered the Decal giveaway! Entered your wall decal giveaway! And I love the Sleepyheads Daisy White Lounger Pajamas! Entry #2 for blogging it.. I like the Frankie & Johnny Think Pink Lounge Set. I love the Tepper Jackson Fez Cobalt Lounger Pajamas. My favorite are: Sleepyheads Happy Snow Days Blue Longsleeve Lounge Set. Perfect for the cold weather outside! I entered the wall decal giveaway as well! I would love to get the Hello Kitty Campus Navy Cami and Short for my daughter. Very cute! Thanks for the giveaway! I love the Sleepyheads Crossword Black & White Tank and Pant Set!